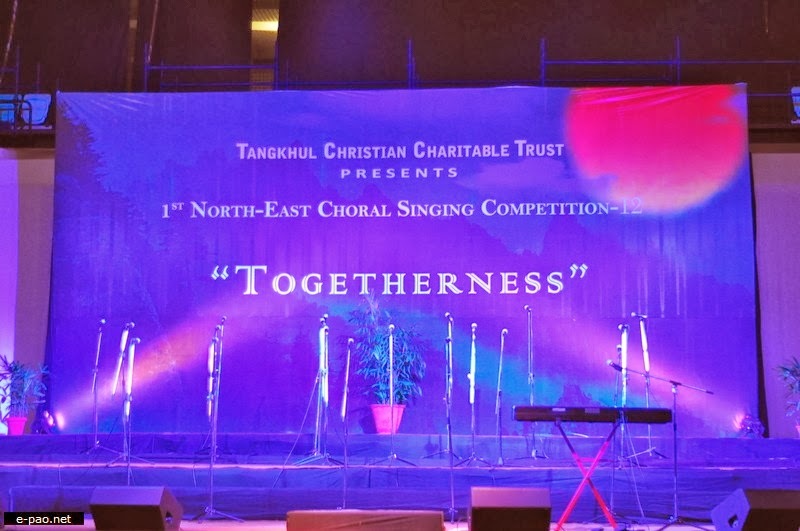 The Tangkhul Christian Charitable Trust (TCCT) is once again organizing the 2nd Annual North East India Singing Competition at Thyagaraj Stadium on 10th Nov. 2013 on the theme "TOGETHERNESS". This will be a one day event with a participation of about 13 Choirs (each choirs comprises of minimum 20 and maximum 60 members) of North Eastern community bases fellowships of NCT. This event will confine not only to Choir competition but also include display of individual singing & Musical talents from different communities. First session: 12.30 pm to 3.00 pm. A combine fellowship of the NE fellowships/churches based in NCR, J. Varadaraj a renowned Minister and National Director, Alpha India will deliver a special talk. And special performances from The Epistle group, Ms. Leno Jamir, Ms. Amongbi Jamir, Ms. Azing Shaiza, Ms. Fiona Pachua, Mr. David Mate, Ms. Maggie Lhouvum & Ao Choir will lead the Singspiration. Indigenous cuisine & exotic menus from different NE region will be available. Second Session: 5.00 pm to 8.30 pm. The second session will be confined to the singing Competition on the Hymn "Amazing Grace". i) The winner ----- Rs. 3.0 Lacs. ii) Second Place-----Rs. 2.0 lacs. iii) Third place ----- Rs. 1.0 lacs. Besides these consolation prizes to all participating teams are offered. The Hon'ble Chief Minister of Govt. of Arunachal Pradesh Shri. Nabam Tuki will grace the occasion as Chief Guest and Shri U K Sangma IAS, Secretary to Ministry of DoNER Government of India will be the Guest of Honours.